A little lace is always in style! 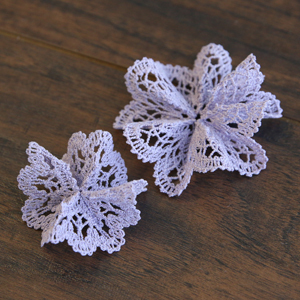 Bring a little vintage flair to any outfit with a freestanding lace brooch you've stitched yourself. 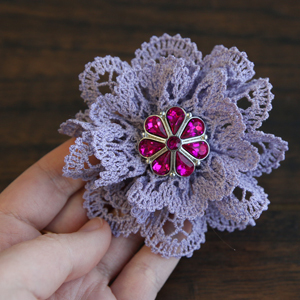 Your favorite cotton thread color and a unique button make this pretty accessory a one-of-a-kind treasure. We'll show you how to make your own! 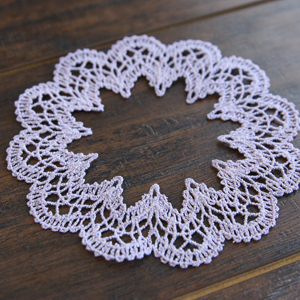 Begin by winding a bobbin with the same thread used in the top needle, and embroidering the two lace pieces onto heavy duty water-soluble stabilizer. 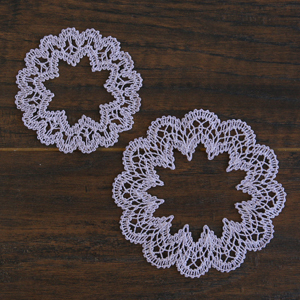 After the lace pieces are embroidered and ready to go, locate the triangle shaped darts on both pieces. These are found around the inner circle (or hole) of each piece. The larger piece has twelve darts, and the smaller piece has eight. Take the larger piece first, and fold the lace piece along one of the darts with right sides together. Match up the straight edges of the dart, and hand stitch the two edges together to close the dart. Then move to the next dart that is right next to the previously sewn one. Alternating the direction you fold each dart is very important. 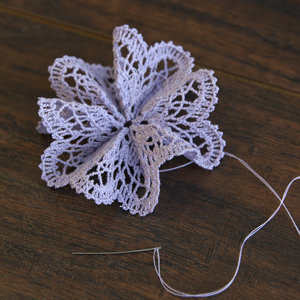 This time, fold it with the wrong sides of the lace together before sewing it closed. Alternating folding the darts with the right and wrong sides together will create the ruffled effect. 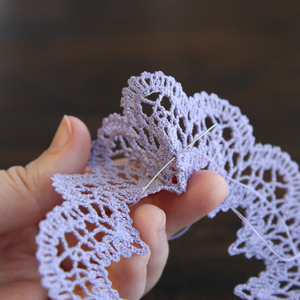 Continue around the lace piece until all twelve darts folded are sew. 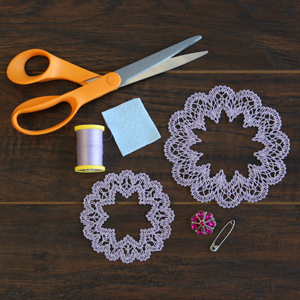 Then repeat these steps to sew the eight darts on the smaller lace piece. Again remember to alternate the direction you sew each dart (so it goes right sides together, then wrong sides together, then right sides together, etc.). 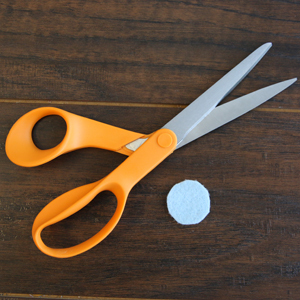 Once all the darts are sewn, cut a small 1" circle out of a felt that is a similar color to the lace. 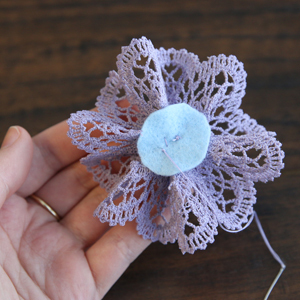 Lay the felt circle on the backside of the larger lace piece, and center it. Then use a hand sewing needle to stitch them together. 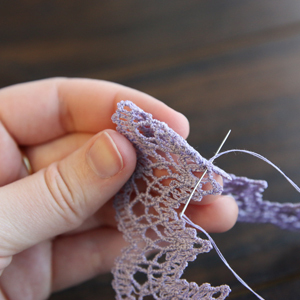 Next lay the smaller lace piece on top of the larger one. Make sure the wrong side of the smaller piece is against the right side of the larger piece, and line up the centers. Use a hand sewing needle and matching thread to sew it in place. 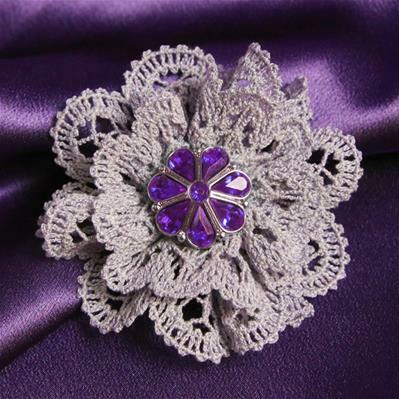 Take a decorative button, and sew it in the center of the lace pieces to create a beautiful accent on the lace brooch. 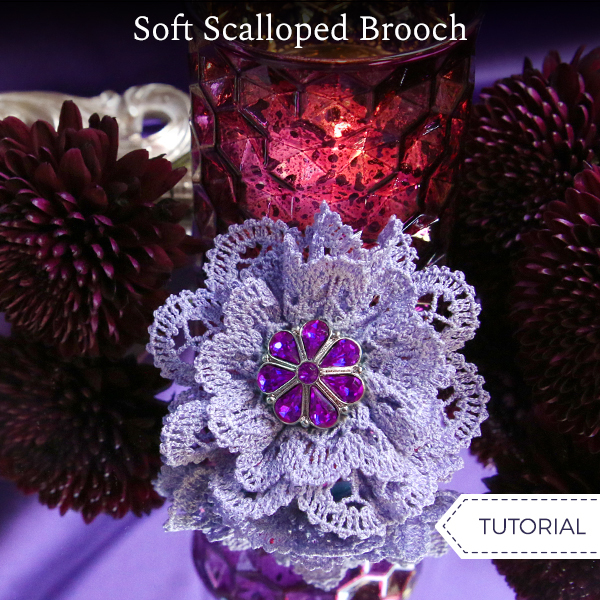 To finish the brooch, flip it over and sew a safety pin onto the felt piece. 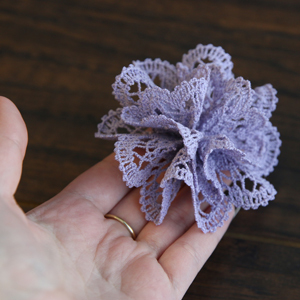 Your delicate brooch is complete! 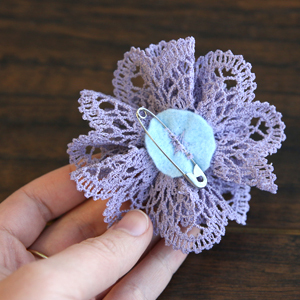 Your choice of cotton thread and decorative button make this pretty accessory a one-of-a-kind treasure. Stitch up several for yourself, and as gifts for friends and family!